Atlanta Commercial Trucks proudly presents two new additions to our Georgia BusinessLink dealership aimed toward the farmers and home builders in Atlanta, Morrow, Marietta and all over the Southeast. Our new Farmers in America and National Association of Home Builders (NAHB) programs are geared toward saving and rewarding the hardworking farmers and home builders of Georgia. As an Atlanta BusinessLink dealer, Atlanta Commercial Trucks can save new RAM 1500 buyers up to an additional $2,000 with On-The-Job incentives. 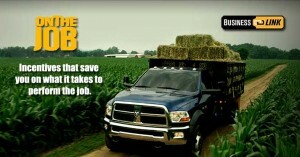 With the new year already in gear, now is the perfect time to upgrade your fleet or get a new truck for the farm. Atlanta Commercial Truck’s Farmers in America program helps out those farmers who use their trusted pickup truck on the job and even as a commuter vehicle every day of the week. Farm land owners in Georgia and all over the Southeast can reap the benefits of this new program. Click here to visit our On The Job page! Vehicles can be registered in the farm name, farm owners or farm employees name for owner/employee benefit. Farm owners and their employees are eligible for an additional $500 cash allowance and their choice of available On-The-Job incentive. Household family members of the owners and employees are eligible only for the $500 cash allowance (will be titled in family member’s name). In the Southeast alone, there are almost 160 chapters of the NAHB, and Atlanta Commercial Trucks is ready to be the Chrysler Business Link program for all of them. A new RAM 1500 pickup has all the capabilities and class-leading features that will set it apart from other work trucks in Atlanta. Vehicles can be registered in the business name, business owner’s name or business employee’s name for owner/employee benefit. Business owners and their employees are eligible for an additional $500 cash allowance and their choice of available On-The-Job incentive. To get the full details of these business incentive programs in Atlanta, give Atlanta Commercial Trucks a call at 855-971-9571 or contact us online to see how we can help your business thrive!